Put a pot of water on the stove and bring to a boil. Meanwhile, slice your bacon into 1/2-inch slices and put it into a hot skillet. Stir and cook on medium until cooked and starting to crisp, about 7 minutes. Strain out some of the fat but leave a good few tablespoons in the pan. Add the can of tomatoes with the juices and the arugula and cook until the arugula is wilted, about 5 minutes. Whisk the mayo and cream together and pour it into the skillet. Stir well and turn heat to low. The water should be boiling at this point, so make sure it is salted well and drop your pasta in. Cook the pasta for only about 3 minutes. Strain the pasta and add it directly to the skillet. Stir and cook for 2 minutes before serving. 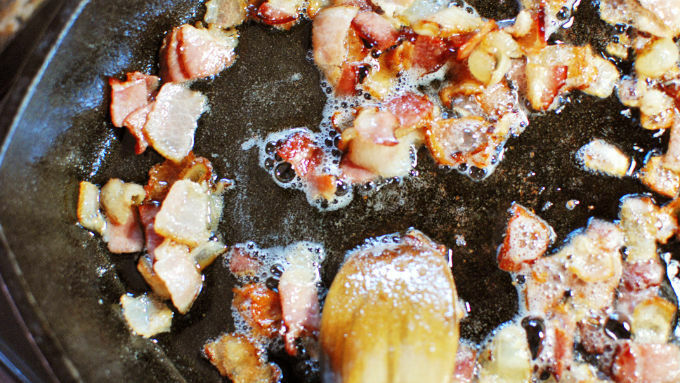 There's something about good bacon sizzling in a cast iron skillet that just makes everything right in the world. If that bacon is being used in BLT anything, it’s even better. Now that fresh tomato season has ended, my choice BLT ingredient becomes canned tomatoes. 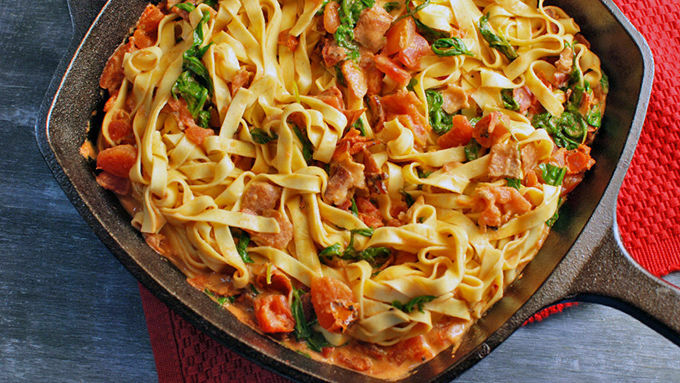 The most common thing I eat with canned tomatoes is pasta, and that's how this dish was born. You don’t really want to put fresh crunchy lettuce into hot pasta – that’s where the arugula comes in to save the day. 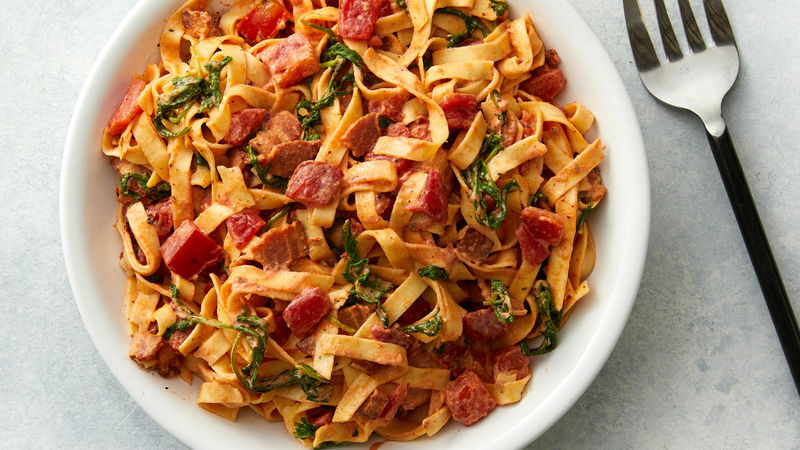 A lot of BLT pasta recipes use cream and a little cheese. First of all, I don’t like cheese in a perfect BLT. But more importantly, a BLT is not a BLT without mayo so I used a mix of cream and mayo to form the base of the sauce. No need to put it into a serving bowl, just bring the skillet to the table! 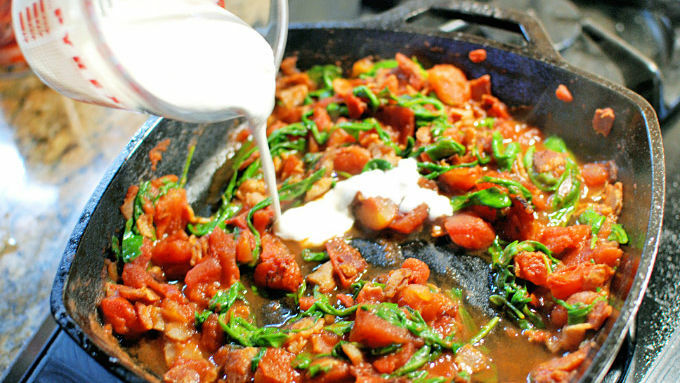 Salty bacon, creamy sauce, and the deep flavors from the tomato and arugula. This is a really good and really easy pasta dish. You won’t be disappointed!